The Road to Loch Torridon is a painting based on Loch Torridon on the west coast of Scotland. The elevated position gives way to an increased sense of depth in the painting. The Road to Loch Torridon was painted for its sharp contrast in light. Another early start. I painted this for the clarity of light that morning. I was struck by this view as I come over the brow of the mountain road and fortunately, there was a car park there when I could stop and take it all in. I'm fascinated by how objects in the distance fade away and create atmospheric perspective. The thing I enjoyed most about this painting was that the viewpoint was elevated, opening up the scale of the depth of the painting. 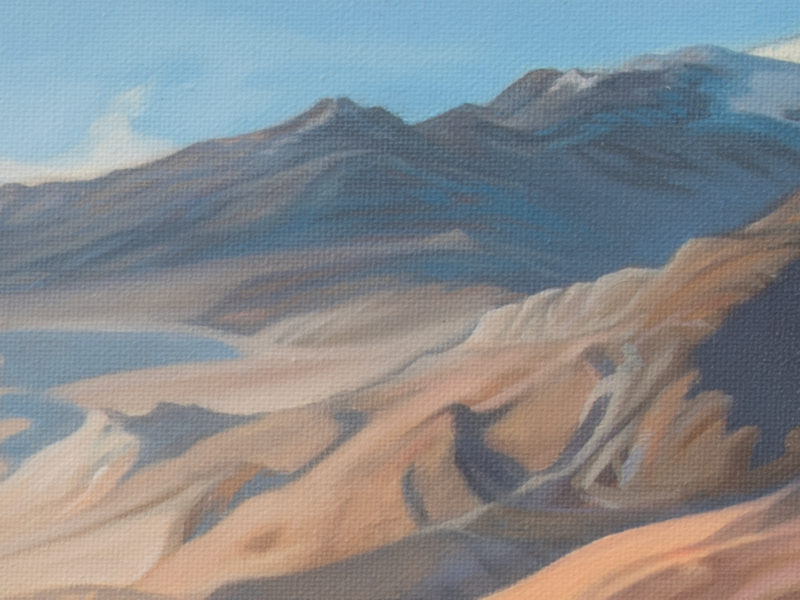 I used quite a lot of dry brush technique in the background to gently reduce the saturation of the hills and push them as far back as possible. The foreground has some texture applied, again to pull it forward for the viewer and emphasise the sense of depth. The painting feels warm and deep and invites you into the horizon by way of the road in the foreground. You want to enjoy the view, but at the same time, you want to get back in the car and find out what's around the other side of the shadowed hill in the midground.